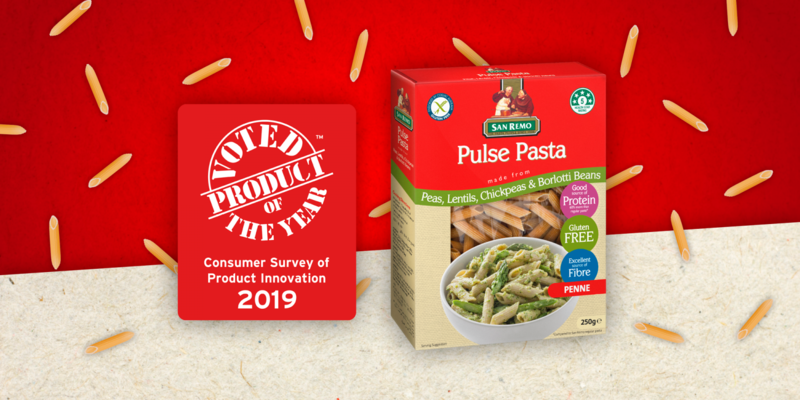 San Remo Pulse Pasta voted Product of the Year 2019! Australian pasta brand San Remo has struck a chord with Aussie consumers, with its innovative Pulse Pasta voted Product of the Year 2019 in the pasta and rice category at the coveted 2019 consumer’s choice awards yesterday. Over 14,000 Australian consumers voted for their favourite products of the year, with a surprising number of new categories that recognise innovations in healthy and gluten free product lines. Ten wins out of a total 50 went to new products offering healthy and allergy free alternatives to everyday food and beverage items. Manufacturers, retailers and restaurants around the country are responding to a rapidly growing consumer demand for plant-based and allergy free products. A 2018 study found Australia is the third fastest growing vegan market in the world, behind the United Arab Emirates and China. San Remo’s Pulse Pasta is made using flour from pulses such as peas, lentils, chickpeas and borlotti beans, to produce an alternative to traditional wheat pasta that appeals to consumers looking for options that are nutritious, natural, gluten-free and offer a plant-based protein alternative. San Remo is the first South Australian food business to take out a Product of the Year title in a Food category. Erik de Roos, Chief Marketing Officer, San Remo, said: “We know Australians love pasta and our Pulse Pasta gives Australian families another way to enjoy it more frequently by offering great taste and a range of nutritional benefits. We continue to see a growing demand for gluten free pasta alternatives, with our Gluten Free pasta variants now making up nearly 10 percent of our total pasta sales. Pulses – or legumes – have significant nutritional value. The pulses used in Pulse Pasta are sources of iron, vitamin B1, fibre and protein, supporting gut health and providing energy with the same sense of satisfaction that consumers expect from a pasta product. San Remo Pulse Pasta has achieved a 5-star health rating and is endorsed by Coeliac Australia. Its Recommended Retail Price is $3.99. San Remo is a 100 percent Australian family-owned business that has been making pasta locally in Adelaide since 1936. San Remo is proud to be the longstanding number one dry pasta brand in Australia and exports to over 35 countries.